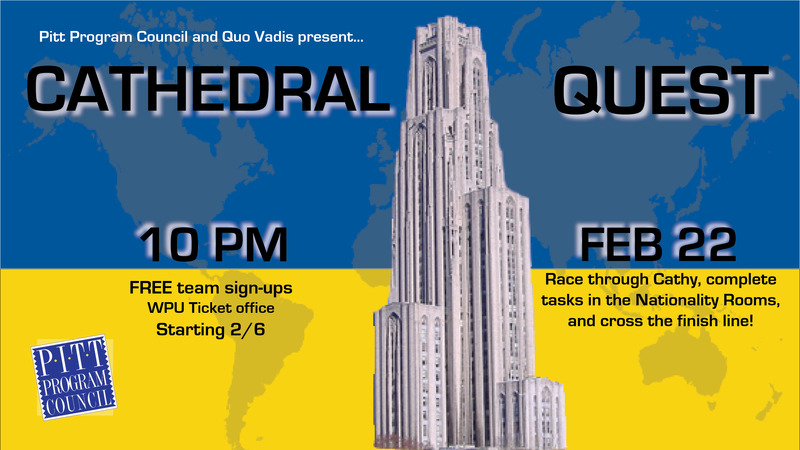 Join Pitt Program and Quo Vadis on Friday, February 22, 2019 for Cathedral Quest – an interactive and diverse expedition throughout the countries of the Cathedral of Learning. Teams of two people will have to work together as they complete tasks and naviaged through the nations represented in the historic building. The first team to successfully compete all of the tasks and cross the finish line will be crowed the winner of Cathedral Quest and will earn bragging rights (and a prize)! So, grab a friend and prepare for the adventure you’ll face during Cathedral Quest. The event will take place from 10:00pm to midnight on Friday, February 22, 2019 in the Cathedral of Learning. Sign up for free at the William Pitt Union Ticket office starting on Wednesday, February 6, 2019.